her first book, A Horse Named Viking. 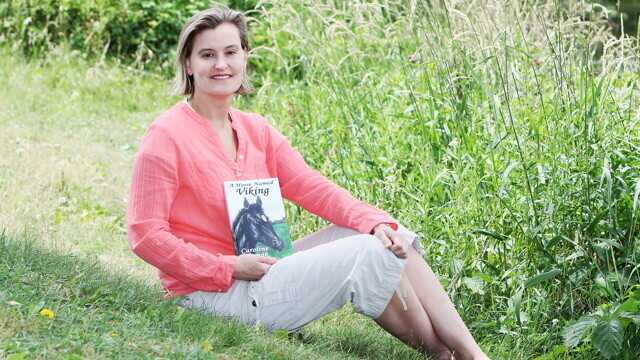 Eau Claire native Caroline Akervik has crafted a tale of perseverance and unlikely triumph for all ages with her debut young adult novel, A Horse Named Viking. Released April 30 through Melange Books’ young adult imprint “Fire and Ice,” the novel follows an “unforgettable horse, proud, powerful, and vitally alive.” Cover art by Julie Schaller, an art teacher in the Eau Claire Area School District, adds another local element. The story begins in Denmark with the birth of a foal, Viking. Viking’s violent mother kills a stable hand soon afterward, and Viking is quickly sold to expel the painful reminder. Viking’s tale moves across the globe as the spellbinding albeit vicious stallion encounters a multitude of trainers with different philosophies on how to tame him. It is not until American horsewoman Anne O’Neil purchases him that Viking’s true worth – his brutal demeanor – shines through. As Anne and Viking rise to recognition in horse competitions, obstacles (both metaphorical and literal) create a bond of determination and trust between horse and trainer.